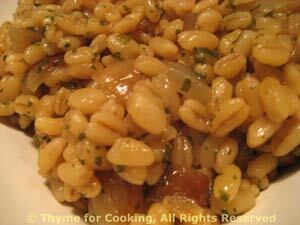 Barley with Browned Shallots, Thyme for Cooking easy gourmet sides. Barley is a hearty, nutritious grain; easy to cook and flavorful. I get the quick-cooking barley which takes 15 minutes. Here it's cooked in beef stock with sautéed shallots for a simple, healthy side dish. Cut shallots in half, through the stem end, and slice. Add shallots and sauté until they start to get tender, about 5 minutes. Add barley, stock and marjoram; stir to combine.